Invite your friends over to enjoy a perfectly cooked pizza and some atmospheric outdoor dining with the superb Kadai Pizza Oven. Designed to make your Kadai firebowl even more versatile, the Pizza Oven will be the most welcome addition to the outdoor dining experience. Transform your Kadai with the fantastic new Pizza Oven designed to fit into your bowl. There’s nothing tastier than a delicious stone baked pizza with a perfectly crisp crust and you can use the smokier technique to give a more authentic and intense barbecue taste. 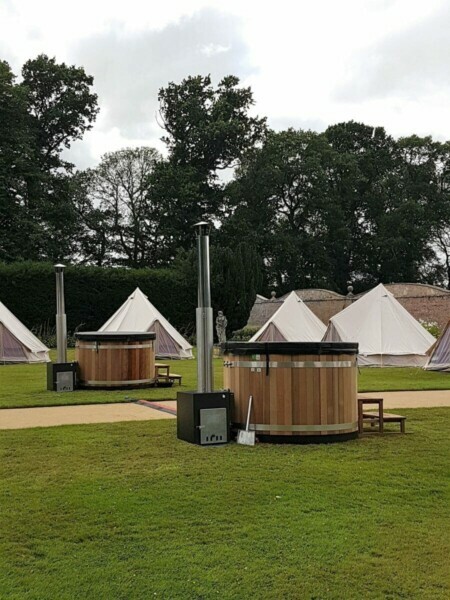 Your friends will love making their own pizzas and watching them cook over a roaring fire whilst enjoying the great outdoors. Please note: The Wood-Fired Pizza Oven is designed to be used on a Kadai of 70cm diameter or larger. 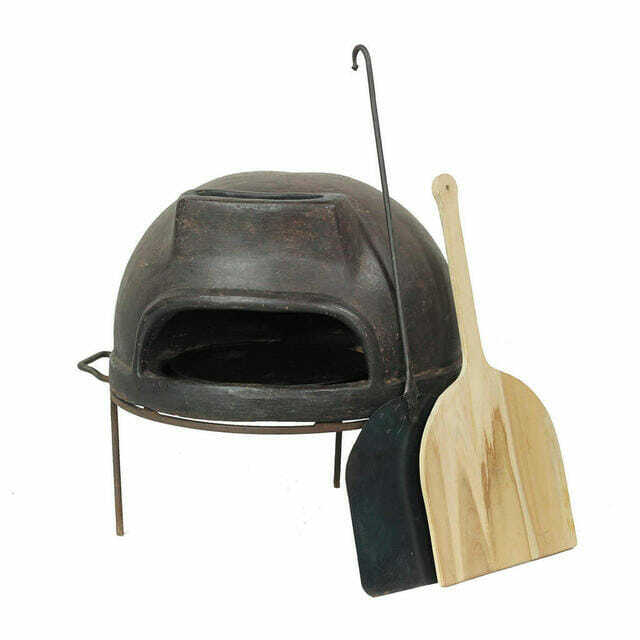 CONTENTS: CLAY PIZZA OVEN, METAL STAND, BOTH WOODEN & METAL PIZZA PEELS AND METAL PIZZA PLATE. Important: Handle with Care. Please pick your oven up using the top of the main opening initially, and then carry it using both hands underneath the base. Do not pick it up upside down from the bottom lip, or the slot in the base. Allow a minimum of half an hour for the oven to reach a reasonable cooking temperature. This may vary depending on the outside temperature. The fire needs to burn fiercely so use smaller kindling and logs that are dry. · We would not advise using paper to light the Kadai as this can cause ash to blow around the oven. · Never use wood or kindling that has been treated. · We recommend using hardwood as a fuel as it will produce great heat for cooking your pizzas. · CAUTION! Do not use spirit or petrol for lighting or re-lighting! · ATTENTION! Natural clay will absorb water, always keep this oven dry. When not in use, keep it covered or indoors. 1. Prepare your Kadai with sand in the base (as per the Kadai Care & Use Instructions). 2. Place your Pizza Oven on its stand in your Kadai. The stand is designed so you can start a fire with the stand and oven already in place. 3. Build a small wigwam of fine kindling towards the back of the Kadai, in line with the cut out in the base of the oven. 4. Once the fire is lit, add more kindling to establish the fire. (Use our Kadai Blow Poker if required). 5. Feed the fire using small hardwood logs. Ideally you need to see flames entering the oven through the cut out. 6. We advise using an oven thermometer (heat proof) to monitor the temperature to ensure that it has reached a minimum of 200 ˚C. 7. Your pizza oven is now ready to use. Your oven is supplied with a Pizza Peel, and a metal Pizza Plate. 1. You can cook fresh or frozen ready-made pizzas, or you can make your own dough. 2. Once your oven is up to temperature, put the pizza on the metal plate and place in the oven. 3. Your pizza should take between 2 to 6 minutes to cook. Timings will vary depending on the intensity of the fire, and the type of pizza crust. 4. To ensure the pizza cooks evenly, use the pizza peel to turn the pizza occasionally. · Do not make your pizza base any bigger than the Metal Pizza Plate. · Flour the Metal Pizza Plate and bottom of the pizza to prevent sticking. · Try not to add too much topping as this may prevent the pizza from cooking through. Important, Handle with Care. Please pick your oven up using the top of the main opening initially, and then carry it using both hands underneath the base. Do not pick it up upside down from the bottom lip, or the slot in the base.